Musings of a Beauty Junkie! So here are my top tips for applying and choosing the right mascara! –Always curl your lashes before applying mascara, doing it after will make your lashes brittle and prone to breakage. –Black mascara looks good on everyone, but for redheads and blondes, brown is great for a natural, daytime look! –NEVER pump your wand in and out of the tube, air will get in and cause bacteria to grow, and your mascara will dry out quicker too! 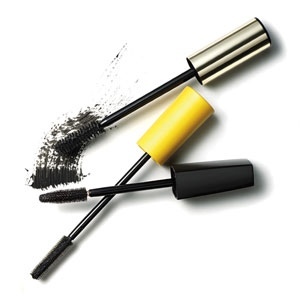 –Replace your mascara every 3 months and never ever share, unless you really want to end up with some nasty eye infections! –When applying, start at the base of the lashes and roll the brush as you work towards the tips for full coverage! 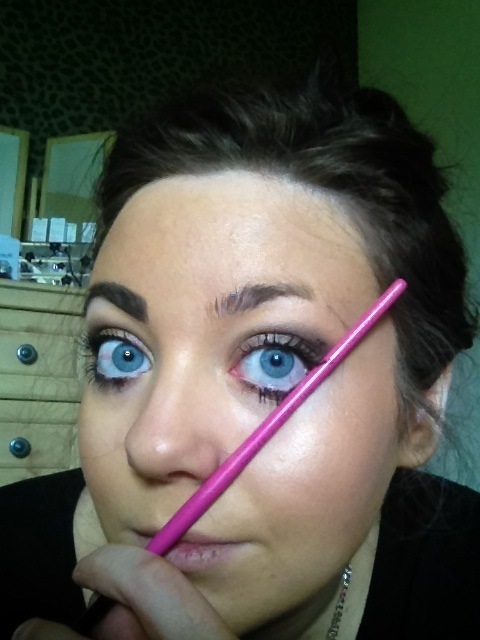 –Let mascara dry between coats for thicker, voluminous lashes without the clump! –Never rub or pull at your lashes when removing mascara, this can irritate the delicate skin around your eyes and can also make lashes fall out. Instead, soak a cotton pad in eye make up remover and hold onto the eyes for a few seconds to dissolve make up. Hope this helped you guys! I’ve decided to start a new series, covering all the basics of make up. Whether your just starting out playing with make up, or a make up connoisseur, I find that there is always something new to be learned or some new tricks to try out! I know that sometimes it is tempting to go a shade or two darker than your natural skin colour to make yourself look more tanned but please, unless you love your face to be a totally different colour to the rest of your body, resist the urge! It never looks natural, always choose a foundation to match your natural skintone, it’s so much easier to bronze it up than trying to lighten a foundation that’s way too dark for you. And I don’t mean on your wrist or the back of your hand! Whether your going to your local drugstore to pick up a purse-friendly foundation or heading to a high-end make up counter, go make up free and test the colours ON YOUR FACE! In natural light, take your chosen shade and swipe from your cheek down to your jawline, beside this colour, do the same with a shade lighter and a shade darker. The one that disappears completely is the one you want. If you want to be extra sure your picking the right one, test it on your forehead too as some people tend to be slightly darker here! To keep you looking fresh and healthy all year round, make sure you have two foundations to hand; one for summer when your tanned, and one for winter when your paler. For the rest of the year, you can mix the two colours together or use separate for certain areas where your skin might be lighter or darker! And here’s how you can get the right consistency for your skin type! Your aim here will be a fresh, dewy complexion and to get this, you will want to choose a hydrating foundation. These have a moisturising formula and you can choose to have a sheer coverage, that you would find in a tinted moisturiser, or medium-full coverage from a liquid or mousse formula. Avoid matte foundations and cakey powders as these will make your skin look even drier. 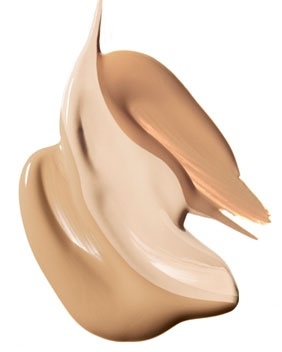 If you have oily skin, obviously you will want to choose a foundation that will keep shine at bay, so look for foundations that state directly on the packaging that they are mattifying or oil free. You can also add a mattifying powder on top to reduce shine. I hope this helped some of you! So, I know that, especially for a lot of you trying to get started in the industry, that building up your make up kit is a major investment and there’s no doubt about it, it’s an expensive hobby sooo, I thought I’d share with you the different cosmetics houses that offer Artist discount programs and how you can get them! Email bobbipro@bobbi-brown.co.uk with your full name and address and they will post you an application form. To get your 40% UK online discount, email artistprogram-uk@narscosmetics.eu for an application form. Discount depending on status, but you can download the form here. International 40% discount, email makeup.artists@lauramercier.com to apply. To get your 40% discount, apply here. To get your 30% discount, apply here. Discount depending on status, and you can apply here. 20% currently only in the US, apply here. Get your 25% Pro discount here. International 20% discount by emailing info@occmakeup.com. Apply for 10% discount here. Apply for Pro discounts inc. 40% off Illamasqua, 35% off Make Up For Ever, 20% off Louise Young, 20% off Bdellium and10% off everything for students if you can provide proof. To apply email enquiries@preciousaboutmakeup.com. Benefit also do a Pro discount but it is currently for the US only! – Business or Comp Cards. If you don’t have a business card yet, you can get simple and cheap ones online, I got mine from www.vistaprint.com. –Tear Sheet. This is a piece of Editorial work with your name printed on it. –Crew Call Sheet. A sheet printed with your name, location and call time, listing everyone else involved and their department. You can usually get these easily if your working on film or tv. –Union Card. You can join a union such as BECTU which entitles you to tonnes of benefits from as little as a tenner a year! Okay ladies, I’ve had quite a few people asking me how I do my eyebrows so I thought I’d do a little post and take you through my daily routine 🙂 now I’m not the only one who likes a strong, angled brow (thanks, Geordie Shore!) 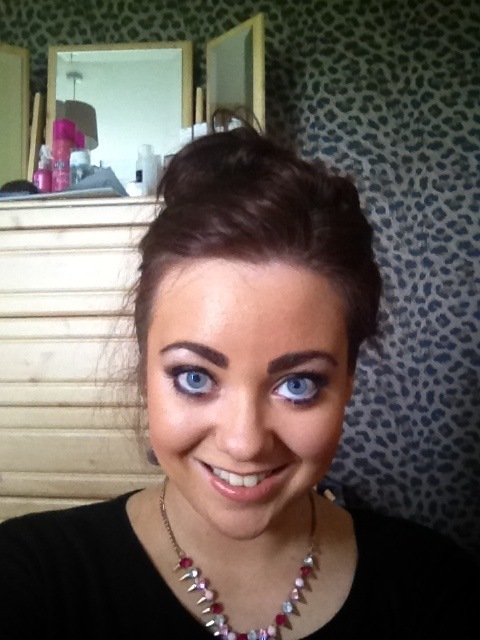 so ill do my best to show you how to brow map yourself at home and get the perfect brow shape. Soo, Brow Mapping basically is used as a guide to show you what the perfect brow shape is for your face shape. Point A (below) is where your eyebrow should start, so use a makeup brush, cotton bud stick, whatever and line it up parallel to the side of your nose and make a little mark with a brow or eyeliner pencil so you know where to start. The reason your eyebrows start here is to slim your face. 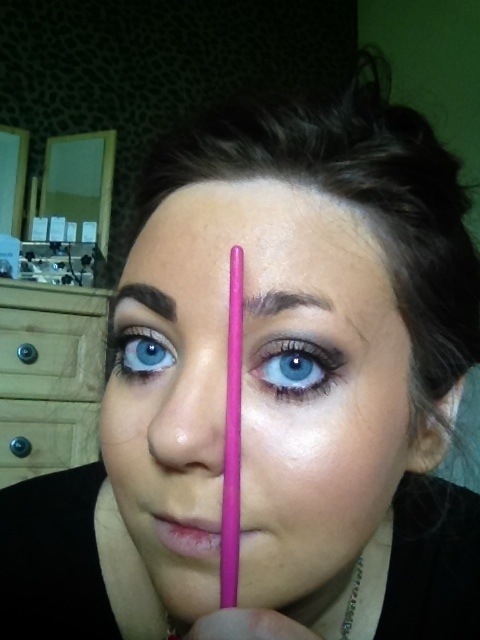 For point B, keep your brush/cotton bud at the side of your nose but angle it slightly so that it moves through the middle of your pupil (like below). This is where your arch should be and gives you an instant eye lift, which is always a bonus! 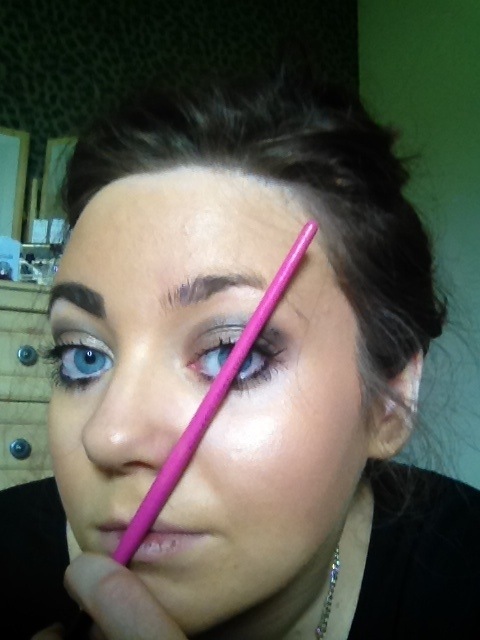 Finally, point C is where your eyebrow should end, so angle your brush/stick from the side of your nose to the edge of your eye. Ending your brow here enhances your cheekbones (take that Cara Delevigne!). So, most people have a basic brow kit I’m sure, if your just using an ancient eyeshadow, please stop, brow products were invented for a reason! Most of my brow products are from Benefit, purely because in my opinion, Benefit are brow royalty in the beauty world, I literally couldn’t live without them! I start with the eyebrow brush from ELF and brush my brows into shape, then outline and fill in using the Benefit instant brow pencil (mine is medium! ), and you can stop there, but I find the overall finish from the pencil leaves my brows looking quite waxy so I just like to go over them using the powder from the Benefit Browzings or Brows a go-go kits (also, medium!). 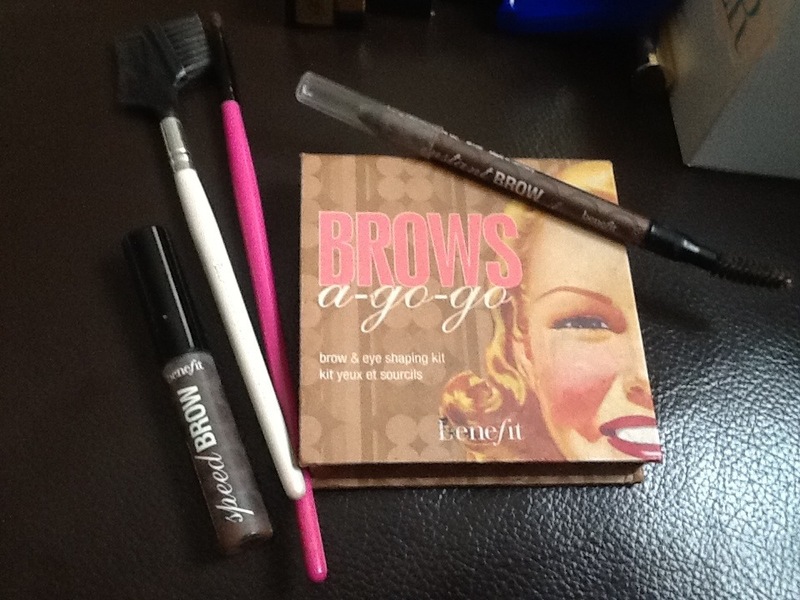 Finally, I use the Benefit Speed Brow if I have any stubborn little hairs that just won’t stay in place. You can see the finished product below! Can’t Find What Your Looking For? Search Here! Reviews: Collection, Topshop & Sleek Lipsticks! Life Update and Exciting New Products! Exclusive Discount Code for CrownBrush..Get 10% off your Christmas Shopping! !